Feeling a bit hemmed in? Then take a trip to the ancient, fascinating landscape of Dartmoor, one of England’s great breathing spaces. With some of Europe’s finest archaeological remains (including circles & stone rows), burial chambers and moss-covered boulders in woods of twisted trees, a visit here feels like falling into a chapter of Tolkien’s Lord of the Rings. Set amongst a sheltered valley in Dartmoor’s favoured south-west edge, Langstone Manor is an idyllic camping escape, perfect for those wanting to discover the brooding, windswept wilds of the adjacent moorland. There’s a relaxed, peaceful atmosphere here, with no long list of rules and regulations. Set in the grounds of a traditional country manor, the entrance to the site (through a field of mobile homes) can be slightly off-putting, however the camping fields are truly superb. Pitches in the Daffodil field are flat, predominantly terraced (to ensure a sense of seclusion), and offer panoramic views across the neighbouring moors. The facilities are of a high standard too. The toilet block is kept immaculately clean, with spacious, roomy showers, vanity basins and flushing toilets, whilst in cooler months the block is heated. There’s also a separate bathroom (for a small charge), ideal if you’re camping with the kids. On a summer's day, Dartmoor is a postcard-maker's dream. 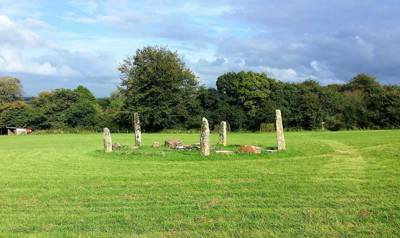 Ponies wander fancy-free, sheep graze beside walking paths and the welcoming communities of Princetown, Widecombe-in-the-Moor, and petite Postbridge bustle along nicely with craft markets, small festivals and cosy pubs. It's this cinematic scenery that persuaded Steven Spielberg to film War Horse here, and Dartmoor also became the setting for Sir Arthur Conan Doyle's legendary crime novel, The Hound of the Baskervilles. When winter arrives and sleeting rain, howling winds and churning mists take over, you can see why Doyle choose this wonderfully eerie wilderness. Many families bring bicycles to Langstone Manor so their offspring can tear along the purpose-built cycle ways, with The Granite Way and Drake's Trail providing spectacular, traffic free routes. If they’re not doing that, guests can usually be found skinny-dipping in the nearby river, or swing merrily in the outdoor play area. As for everyone else? Well, they’re just kicking back and enjoying that peaceful, relaxed atmosphere. 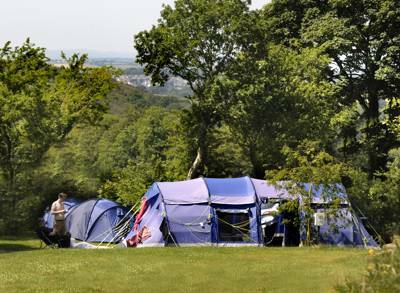 Close to the town of Tavistock on Dartmoor National Park in a peaceful sheltered valley - we have camping pitches, camping pods, mega pods & a range of self-catering accommodation. Langstone Manor has a small bar serving evening meals. For latest availability and best prices for Langstone Manor, please use the Date Search above. At Langstone Manor Park we have something for everyone! 40 (30 with electric hook-ups) level, terraced pitches, with views over Dartmoor & the countryside, suitable for tents, touring vans, motorhomes, campervans & trailer tents. For those of you that like the experience of the great outdoors but don't fancy bringing a tent we have our cosy camping pods & for those of you that like a few extras - like your own loo, we have our mega pods! Also on site are centrally heated static caravans, and Honeysuckle & Maple cottages as well as Pewtor our upstairs manor house apartment. 40 pitches for traditional campers, 1 camping pod suitable for a couple or a family with 2 small children, larger pods with room for up to 4 adults also available. Two of the larger pods are pet friendly (additional fee payable.) Free hot showers, toilets, hair-dryers, nappy changers, an accessible family bathroom, under-floor heating, laundry and dishwashing area. There’s also a grey-water waste for motorhomes and water points around the park. The reception supplies basic needs including gas and bio-degradable portable toilet liquid. The manor house (which has a non-smoking policy throughout) has a wonderful lounge bar, dining room, WiFi access and games room available, with table football, air hockey, pool and a video games machine. The lounge area has a woodburner with overhead drying racks for wet gear. A library where guests can swap and borrow books, board games and toys is an excellent idea for rain days. Young visitors will also enjoy a brand new playground, surrounded by grass and picnic benches. The naval port of Plymouth suffered extensive bomb damage during WW2, and for decades many dismissed the seaside town as ugly, pointing to its post-war architectural eyesores. However today Plymouth is packed with possibilities. You can tour its fabulous local gin distillery (01752 665 292), swim in the art deco Tinside lido (01752 261945), discover the underwater delights of the National Marine Aquarium (0844 893 7938), or see a top class theatre show (01752 267222). And the pièce de résistance? Plymouth Hoe; a café lined headland, offering stunning views over the bay. Take a trip to nearby Tavistock (3 miles) and see who’s performing at the Wharf an Arts & Entertainment Centre (01822 611166), a great little venue for music nights. There, the cinema links with the Meadowlands Leisure Pool in the summer holidays, so you can pop in for a swim then watch a movie. Take a cruise on the Calstock ferry (01822 833331) along the Tamar river, one of the most scenic county boundaries in Britain. Sailing times depends on the tide so be sure to check departure times in advance. The site can provide freshly baked baguettes, rolls and croissants. The manor house has an excellent lounge bar and dining room. The indoor pannier market in Tavistock along with the Farmers market (every 2nd and 4th Saturday in the month) have a great selection of local produce. Offsite, The Peter Tavy Inn (01822 810348) is a traditional 15th century pub with ancient timber beams, and in winter, cosy log fires. On warm days, the garden provides a perfect setting to enjoy a meal and a drink, looking out over the Dartmoor countryside. The Whitchurch Inn (01822 612181) is a great place to enjoy a hearty, freshly cooked meal from the seasonal menu or extensive specials board. They offer a choice of local, delicious meats for their locally renowned Sunday roast, and there’s also a varied selection of vegetarian options on offer. Tavistock is only a short drive away and has a wide selection of places to grab a good meal, including: The Cornish Arms (01822 612145), Taylors (01822 613045) and for something extra special, Gortons (01822 617581), the creation of TV chef Peter Gorton. 17th March 2018 – 2nd November 2018. Pitch from £18-£23 for 2 people, and pods start from £45. Green rate available for walkers and cyclists; see website for more details. Take the A30 towards Okehampton across the top of Dartmoor, then the A386 to Tavistock. From Tavistock, take the B3357 Princetown road and after approximately 2 miles turn right at the crossroads. Pass over the cattle grid, continue up the hill, and turn left following the sites sign. You will shortly see Langstone Manor on your right. IF YOU ARE TOWING OR IN A LARGE VEHICLE DO NOT FOLLOW SAT NAV. Plymouth is the nearest train station (12 miles), with First Great Western (0345 7000 125) serving on the main line from London, some of which terminate at Plymouth. Most CrossCountry (0844 8110 124) trains from Scotland and the North of England (via Bristol) terminate at Plymouth, with three continuing to Penzance in the evening. Tavistock bus station is only 3 miles away.